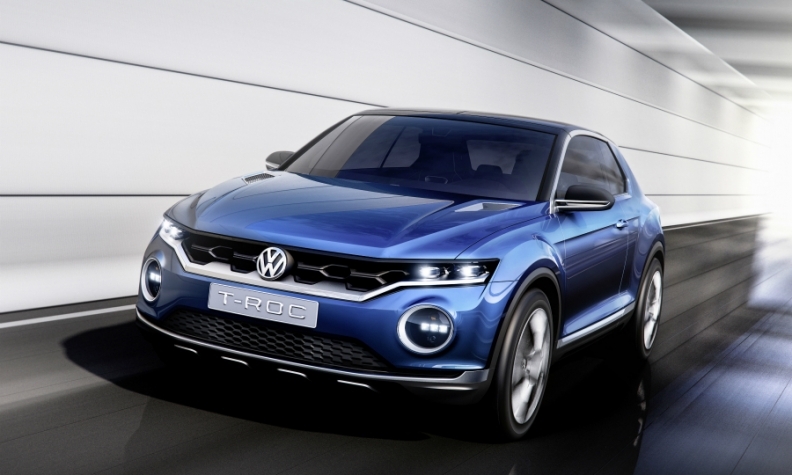 The forthcoming T-Roc crossover is a strong candidate to be the first VW model to offer a 48-volt mild hybrid system. A T-Roc concept is shown. BERLIN -- Volkswagen brand's first vehicle with a 48-volt mild hybrid will be a Golf-sized model, head of development Frank Welsch told Automotive News Europe. After that it will not take long to rollout the technology in other vehicles, he said. "Once we have it in an MQB-based model it's more or less plug and play," Welsch said on the sidelines of the press launch for the new VW Polo here last month. "We can put it on other models because we have a modular platform." VW's MQB platform underpins models ranging from the sixth-generation Polo subcompact that goes on sale in Europe in autumn to compact models such as the Golf hatchback and Tiguan SUV, as well as the Skoda Octavia and Seat Leon compacts. Automakers are adopting 48-volt systems to help fuel efficiency as diesel cars face a consumer backlash because of their toxic NOx emissions. Renault is offering the technology on its latest Scenic minivan. VW Group is looking for alternatives to diesels as several European cities plan to ban the powertrain to reduce the level of smog-causing nitrogen oxides (NOx) in the air. The backlash against diesel has intensified since VW admitted in September 2015 that it cheated global emissions test and sold cars that produced NOx that far exceed government standards in several countries. VW Group has had to recall more than 11 million vehicles worldwide to fix the problem. Another factor working against diesels is that to make them comply with tougher pollution rules expensive after-treatment solutions such as selective catalytic reduction (SCR) must be added. VW has equipped both of the 1.5-liter diesels it will offer in the new Polo with SCR. The cost to adopt SCR adds about 200 euros to the cost of a vehicle, estimates Vicente Franco, who is a senior researcher at the International Council on Clean Transportation. Earlier this year, Welsch told the UK's Autocar magazine that adding a diesel in the Polo "is 25 percent of the car itself." He also said that after-treatment systems in diesels add "six to eight hundred euros in material costs." That is a hard hit for a powertrain option that VW expects will account for 15 percent of the Polo's global sales. The new 1.5-liter common-rail diesel in the new Polo was planned to form part of a new small engine offensive by VW, but the high cost of developing an effective after-treatment system for the successor to the EA827 1.6-liter turbocharged diesel powertrain, offered in the current Polo, caused the carmaker to rethink its move into mild hybrid technology. The company will continue to develop its larger, more versatile EA288 2.0-liter turbocharged diesel, which is used in a variety of VW Group vehicles, but nothing smaller, Car and Driver reported in a separate article. When ask by ANE whether the Golf itself would be the first 48-volt mild hybrid, Welsch said: "When I do development of these technologies it is not important which car gets it first. We have to have the technology ready and then we decide which car will get it first and in which market. We are in the middle of developing this, but it will definitely come." One strong candidate to be the first model with the system is VW's new T-Roc SUV, which is set to debut later this year and be positioned below the Tiguan.